It’s been a hectic week with having to move the three satellites in and out the cleanroom – it was a bit like playing musical chairs! Our Astrium colleagues had it all under careful control so it went really well. And some of them have spent time listening to Swarm ….. It might seem strange but the Astrium engineers not only have to use their eyes for all this testing, but they also have to listen as well! The photo shows an engineer using stethoscope to hear if the high pressure latch valve opens and closes properly. 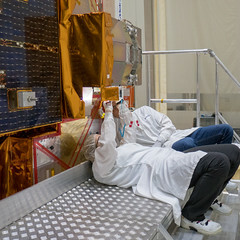 As well as the to and fro, they started the process of fuelling the FM2 satellite yesterday, which will continue until this evening. In the meantime, FM3, which is back from being fully fuelled, passed its health check with flying colours.In addition, side-B of FM1 had its ‘functional test’ and its Langmuir probe was cleaned, as shown in the photo below. 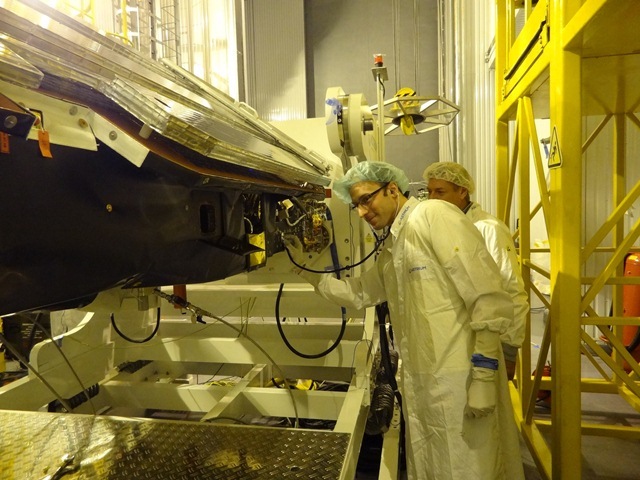 This sensitive probe is positioned under the satellite to provide measurements of electron density, electron temperature and the electrical potential of the satellite when it is in orbit.